Are you not soaking wet!?!? Noah is the latest effort from accomplished filmmaker Darren Aronofsky, director of Pi, Requiem for a Dream, The Fountain, The Wrestler and most-recently Black Swan. Roughly based on the biblical story of Noah's Ark, Aronofsky finds himself stepping a bit out of his comfort zone in directing his first film with a budget over 35 million dollars. I have been a fan of Aronofsky's work for the most part (I did not enjoy Black Swan that much though) and was intrigued about seeing his take on a classic story. Thankfully, it turns out that Aronofsky knows just what to do with a large increase in budget ($115 million for this film) and delivers the best film thus far of 2014. The plot of this movie is pretty well known if you've ever read the bible or been to Sunday School. The creator (never referred to as "God" in this movie) believes that the human race has been corrupted and vows to cleanse the Earth of every man and woman via a torrential storm that causes a global flood. 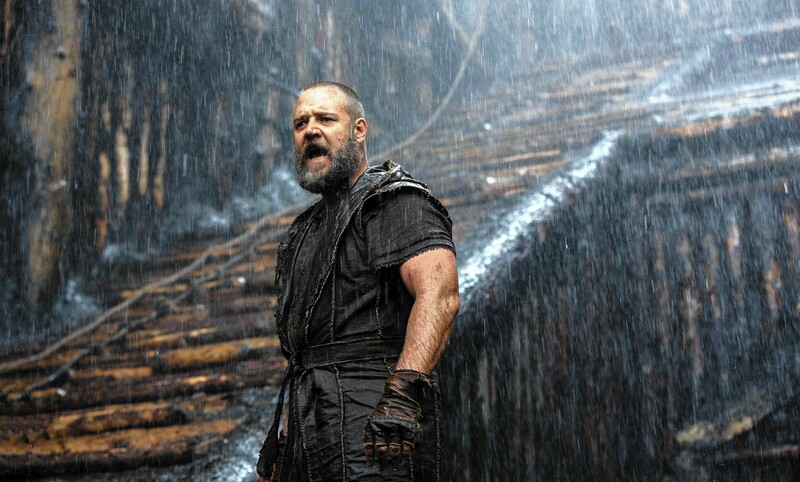 Noah, played by Russell Crowe, (a descendent of Seth, an outcast brother of Cain and Abel) consults his grandfather Methuselah (portrayed by the go-to old guy of the moment, Anthony Hopkins) who helps him communicate with the creator through visions to determine that the flood is going to happen. Noah believes that the creator wants him to build an ark and house animals from all species as well as his family which includes his wife (Aronofsky favorite, Jennifer Connelly), his two sons and his son's girlfriend Ila (Emma Watson). An angry villager (the deliciously evil Ray Winstone) attempts to thwart Noah's master plan and leads to the tense penultimate sequence where Noah ends up in both a physical battle with his adversaries and a philosophical battle over whether to personally carry out the creator's wishes and end the human race by his own two hands. After a weak turn in Les Miserables, it's safe to say that Russell Crowe is officially back after his physical and commanding performance as the title character in this film. He commands the screen in every scene he's in and seems to channel Maximus from Gladiator at times. His performance is boosted by the two incredibly emotional turns from Connelly and Watson who end up reacting organically and emotionally devastatingly to the choice that Noah has before him at the end of the film. Watson in particular makes you totally forget that she played Hermione in Harry Potter for a decade. She proves that she is an up and coming star in the making in Hollywood. The challenging story that Aronofsky is tackling here would be a much more difficult task if not for the quality of acting that comes off on-screen. Every actor seems to be all-in with a real commitment to their roles and to further the story. The hefty budget of this film allows for some excellent special effects. The giant rock people known as The Watchers (angels fallen from heaven) which are introduced at the start of the film end up playing a key role in helping Noah complete his task. At first the multi-armed Watchers seemed to be a bit out of place in this biblical tale. It took some time to get used to but the creatures are integral to the plot and I really applaud Aronofsky's willingness to take some creative license with this well-known story. The flood and ark scenes are extremely powerful and take on an even more grandiose presence thanks to the excellent driving original score composed by Aronofsky's right-hand composer Clint Mansell. Noah is truly a hollywood epic film and in the expert hands of a director who is at the top of his game it makes for a very exciting and entertaining movie. Aronofsky is a master at extracting premium performances from his actors (Natalie Portman winning Best Actress for Black Swan as an example), and he succeeds completely in this film. Bravo acting across the board help supplement some impressive visuals and make Noah the second must-see film of 2014. Please go see this movie in the theater as the sound and vision of Aronofsky is tailor made for the large-screen format. A near-perfect 4.5 JRs for Noah, Darren Aronofsky's crown jewel in an accomplished career of directing.